Marc Coma continued his dominance of the 2009 Dakar by winning his third stage win in four days ahead of factory KTM team-mate Cyril Despres. Starting the revised 380KM stage first, Coma was unfazed by the more technical and sometimes rocky terrain to finish in 4h 09m 32s. His victory sees him stretch his advantage on the overall leader board with the Spaniard now leading by 42m 57s from in form American Jonah Street. Cyril Despres showed just what he is capable when he doesn’t have any problems by blitzing the special stage. The Red Bull KTM rider started in 47th place and finished in an incredible second spot just 1m 17s behind Coma. His strong ride moves the 2007 race winner up to 11th overall in the standings but he still trails Coma by a massive 1h 37m 07s. Despres said:” I can't tell you what a pleasure it was to have a trouble free run. The tracks were really nice and I even managed to forget how far behind I am overall. "I started in 47th place this morning and overtook about 40 bikes, and obviously that takes a little time, so to finish just behind Marc isn't too bad. Now we have to work at getting some time back. Third place went to American Jonah Street, a result that moves him up to second overall in the standings ahead of Yamaha man David Fretigne who finished the stage in fourth. The honour of top Brit once again went to Stanley Watt (KTM Front Row GB) who eventually claimed 26th on the stage. "The 37 year old Brit stopped to help an injured rider which subsequently cost him in the region of 45 minutes, but after speaking to the race direction he had the 45 minutes taken off his time meaning that he has now move up into the top 20 overall. "Honda Europe backed Mick Extance had another good day to claim 30th and 28th overall with Craig Bounds (KTM Desert Rose Racing) in 77th. Ewan Bucham (KTM Desert Rose Racing) secured a solid 107th with Jonathan Stamper (KTM Front Row GB) 127th, Gary Ennis (KTM Team Dakar Ireland) 151st and Phillip Noone (Team Dolphin Racing KTM) 152nd. Stage four of the Dakar saw a further 11 bikes retire bringing the tally to 42 during the first four days. 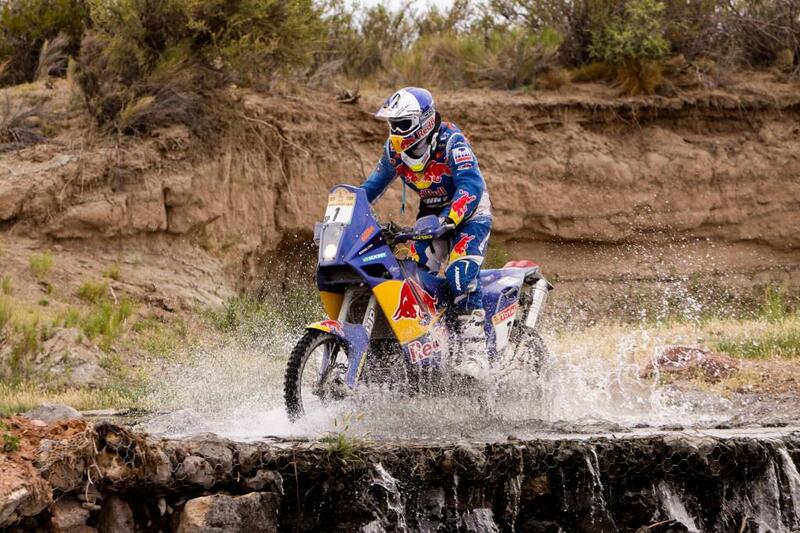 Day five of the Dakar sees the remaining 156 competitors travel a total of 763Km from Neuquen to San Rafael. The day includes a 506KM special and promises to be the hardest so far including 20KMs of sand dunes.